AS odd as that may seem, the USPTO actually grants some patents on GUIs (and a high court defended one such patent last month). So does the EPO, with notable examples like a progress bar, slide to unlock, and even worse things (like one-click shopping). It’s amazing, isn’t it? How shallow and superficial can some patents be? Do these even count as innovations at all? Not really. The Federal Circuit continues to provide much needed guidance (and relief) in interpreting patent eligibility under 35 U.S.C. §101. In Core Wireless Licensing v. LG Electronics (Fed. Cir. January 25, 2018), the Federal Circuit affirmed the eligibility of a patent relating to an improved user interface for computing devices. The decision yields arguments and approaches for eligibility of software patents in general. § 101 was attempted as a defense, but the patent in question isn’t the Alice type. 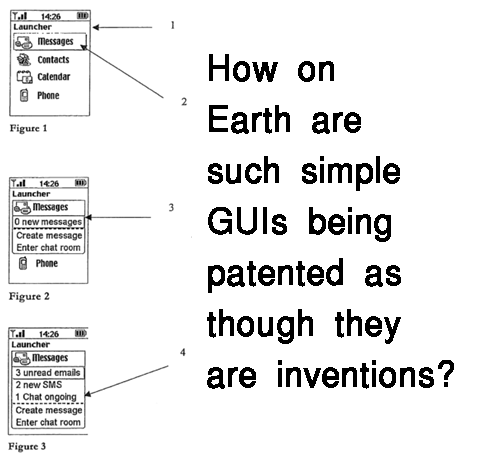 In China, by contrast, GUI patents have actually suffered a blow. There’s lots of spin about that, as one might expect. “In China, by contrast, GUI patents have actually suffered a blow. There’s lots of spin about that, as one might expect.”A few days ago, copy-pasting Ran Wang and Xiaoyan Feng of Liu Shen & Associates in Beijing, IAM went with the misleading headline “China’s first court decision on GUI design patent infringement narrows avenues for protecting software” (but no, GUI patents are not software; there’s no algorithm associated with them). We wrote about that last weekend. It’s actually encouraging to see that even though SIPO became somewhat of a garbage dump/landfill of low-quality patents, Chinese courts are sometimes willing to stand in the way.